adidas Consortium will be releasing a brand new Ultra Boost Collection for the Fall/Winter 2018 season that is comprised of A Kind of Guise, Engineered Garments, Études and Kinfolk. For this release Brooklyn/Tokyo-based store Kinfolk celebrates their 10-year anniversary. 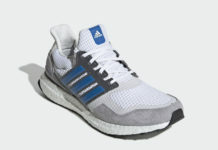 Dressed in multiple shades of Blue, Kinfolk’s Ultra Boost features a two-tone Primeknit upper with butter-soft nubuck leather on the mudguard and heel cage. Speckled laces with Kinfolk branding on the tongues atop a standard White Boost midsole completes the design. Look for the Kinfolk x adidas Ultra Boost to release on November 10th at select adidas Consortium retailers. The retail price tag is set at $220 USD.